Okay, I'm back, after a brief rest to try to get some energy restored. Here are some of the rail-themed photos I took today (other, general ones to follow). 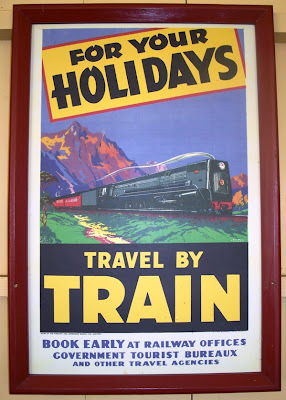 Above, one of the old NZR advertisements on display at Glenbrook station. 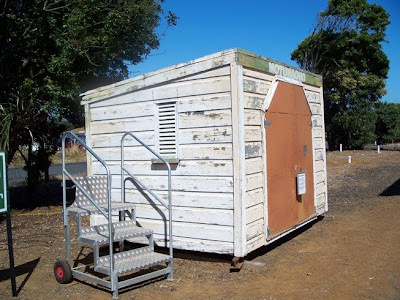 According to the information tag attached to the building, this was an unmanned flag station building from Motumaoho, along the Hamilton to Morrinsville line, and is under restoration at Glenbrook. The original rail line was under construction in 1881, reaching Motumaoho by March that year (Waikato Times, 24 March 1881). Only thing I could find as to history of that part of the country online was this tale of a local farmer from the district and his artificial leg. 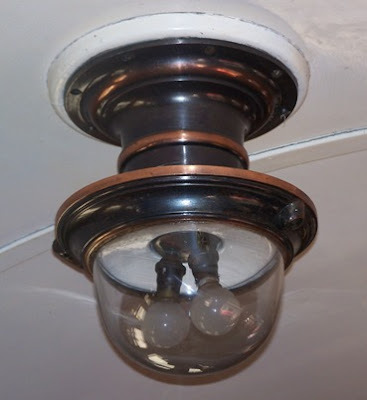 Above, a ceiling light of one of the carriages. Below, some of the locomotives at the workshops. Ww480, originally built at Hillside workshops, 1910. Internal shot of the workshops here. Wab 800. originally built 1927 by A & G Price Ltd, Thames (judging from the GVR rolling stock register). GVR No. 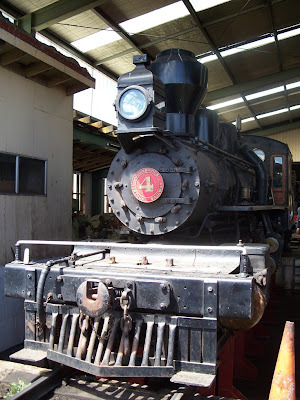 4, TTT 7, built 1912 by the American Locomotive Company (ALCO), USA, for the Taupo Totara Timber Company. 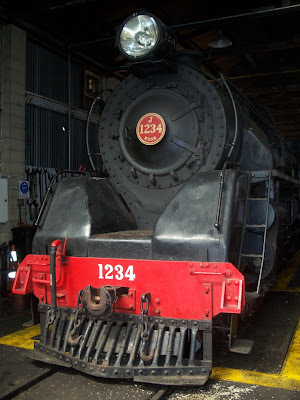 J 1234, originally built 1939 by North British Locomotive Company. 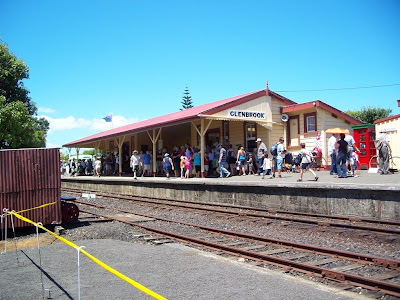 Below, waiting to head back to Glenbrook station from the workshops. An experiment where I took a photo out the open window of the carriage. Don't worry, I'm not daft enough to do this while the train is in motion! 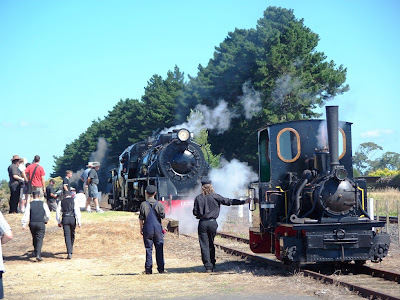 That little engine in the 2nd photo down looks like our Puffing Billy steam train. Is that narrow gauge track (3 foot 6 inches) ? Those bigger engines look lovely, like big busy showgirls ready to dance the chorus line down the track. Those posters are great, could be used as art work on anyone's wall. 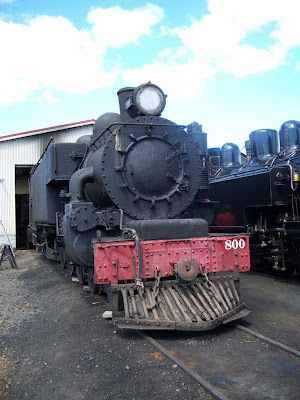 Near as I can work out from the rolling stock registers online, that wee engine is part of MOTAT's collection, possibly an F class (but, I'm out of my depth there with classifications and such). Definitely 19th century. 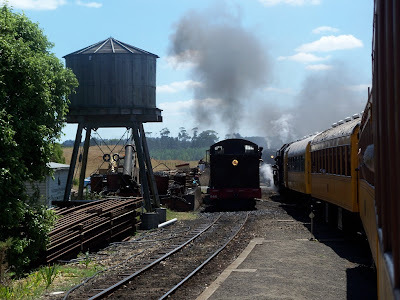 Your Puffing Billy (as I follow through the links to a register) appears to be G class. So -- slightly different, but not all that far apart period-wise. 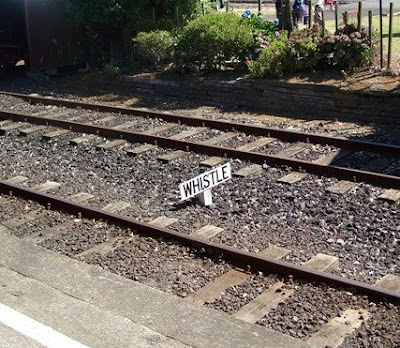 Some at the show yesterday were saying that MOTAT loco was to blame for starting a grass fire out on the line between the workshops at Fairleigh and the Glenbrook station. Can't see how, though -- I don't think it was allowed to stray far from where it was basically parked, puffing away, for the day. 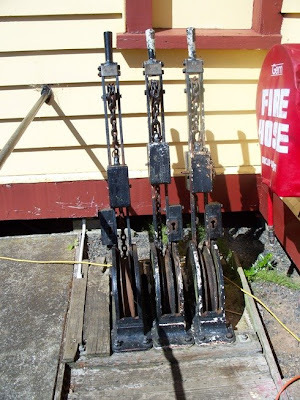 Yes, the Glenbrook gauge is 3'6", as with the NZ standard. 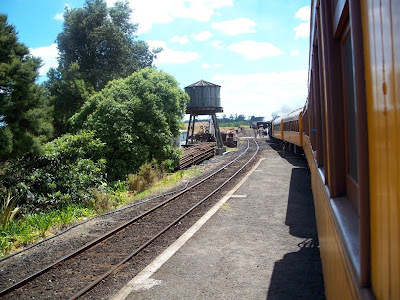 I'll post a link to an explanation from the old NZ Railways Magazine as to why we went that way. 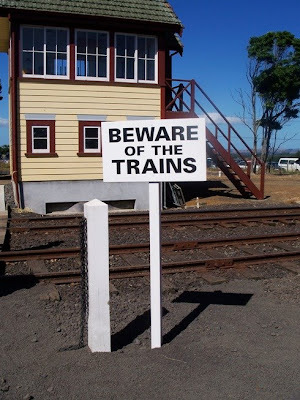 Any NZ railfans reading this and thinking, "Hey, such-and-such a statement is wrong ...!" please do comment or send an email. I'll correct any errors -- I'd rather have the right info, than incorrect facts here! Yes, the posters are cool. 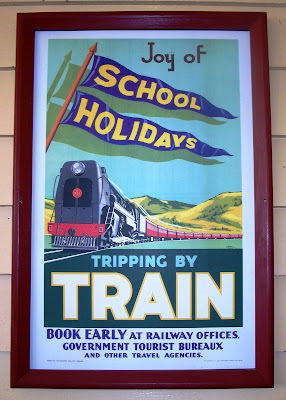 I used a photo I took of the school holiday one for part of the cover of the NZ Legacy magazine's rail themed issue (late 2008). Worked a charm amongst the sepia and b/w images. The small locomotive is a 1904 Orenstein and Koppel 0-4-0WT well tank locomotive which was operated by various private owners..the last one being Portland Cement Co. 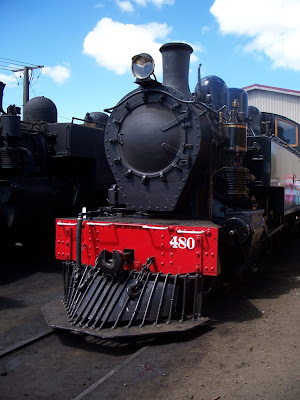 The loco is one of MOTAT's locomotives.